If you're startled at the sight of flying ants, don't be too alarmed. During the spring, ants grow wings and fly to new places in search of shelter and food. When you spot flying ants, it's the first clue that they plan to make themselves comfortable around or near the outside areas of your home. Although you might be unable to completely eradicate ants around your home, with the proper precautions and interventions, you can safely eliminate many of these creatures. Confirm that the insect is indeed a flying ant and not a termite, as they share similar appearances. Ants usually have slim waists and elbow-shaped antennae, while termites are generally white in appearance with thicker waists and straight antennae that resemble stringed beads. Remove all trash bags or containers from the area, as this will attract ants to the outside section of your home. 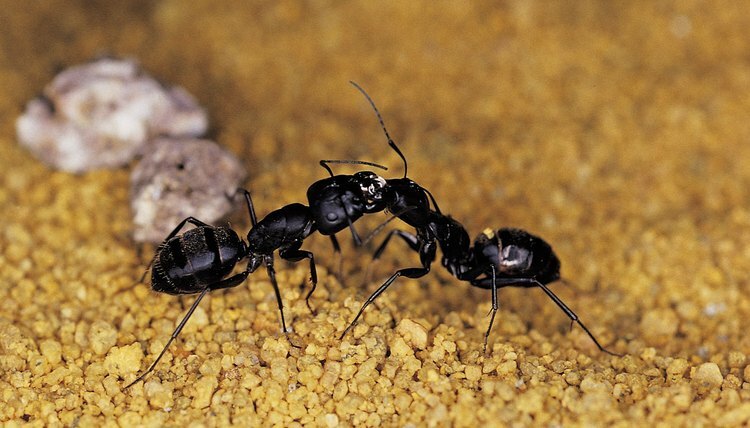 Most ants generally love to eat starchy, greasy and sweet foods. As long as these types of foods are readily available in your trash bin, the pesky creatures will continue to return to the area. Look for any cracks and crevices near windows, doors and along the sides of your home and seal them with caulk or petroleum jelly. If you don't close these entry points, the ants will eventually search for more food inside your house. Scrub the area near the entry points with water and a mild detergent or spray the area with glass cleaner. This will help eliminate the pheromone scent trail left by the ants, which alerts other ants about food in the area. When done, spray an insecticide that leaves a coating or residue in the cracks and crevices. You can purchase regular insecticide from most home and garden centers or less toxic versions made from natural products. Place bait traps near the areas with the largest infestation. The goal is to get the ants to eat and carry the bait back to the nest with other workers, queens and larvae. Note that when using baits, you might need to wait several weeks or more to see results. When using insecticides and baits, it's best to choose one method, as you may kill the worker ants with the insecticide before they return to the nest.